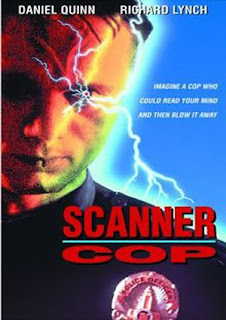 Scanner Cop (along with its sequel, Scanner Cop 2) is a spin-off film from the original Scanners series, and while not as good as Cronenberg’s original, it is a decent sci-fi cop thriller. 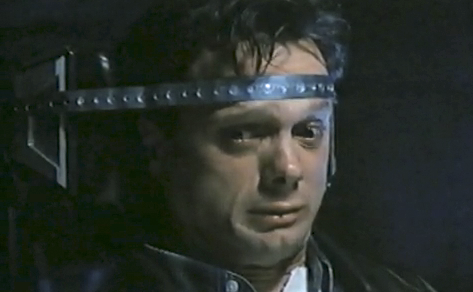 Rescued by a kindly police officer from his out of control Scanner dad, Samuel Staziak (Quinn) grows up to be a cop. Learning to suppress and control his Scanner abilities (reading minds, controlling people’s actions), Staziak just wants to lead a normal life. However, the evil Dr. Carl Glock (Lynch) disrupts these plans with his plot to wipe out the L.A. Police Force through mind control. 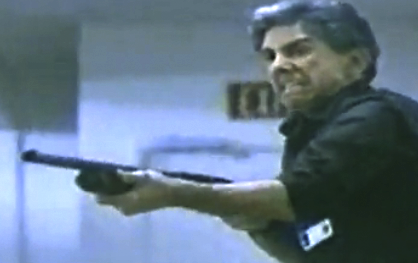 This forces Staziak to unleash his Scanner abilities to prevent Glock’s plan. Directed by Pierre David (producer of Mission of Justice, Scanners 2 & 3), Scanner Cop is a fairly ludicrous affair but no less entertaining for it. Decently shot (though the lighting tends to be a bit dark) and produced, the actors do their best with the material given. Basically a cop thriller with a bit of Scanners thrown in, the film still displays some nifty special effects sequences. 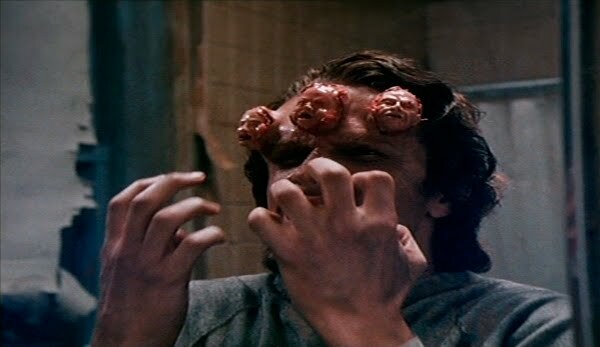 Courtesy of John Carl Buechler (From Beyond, Bride Of Re-Animator), we get engorged veins, metal plates exploding from heads, a giant insect and three tiny heads bursting from another character’s forehead. There is also the obligatory Scanners exploding head shot. Yet the best is saved for the rather disturbing scene when the hero wanders through a mental asylum (representing Hell, which another character is stuck in) where the inmates are doing lots of wrong (very wrong) things to one another. Gross, but very effective. Add in Drake from Aliens (Mark Rolston), a cameo from the late, great Brion James (Bladerunner) and a good amount of silliness and Scanner action, and you have an entertaining hour and a half of mind-frying entertainment. This looks like a fun one! Big fan of practical effects and Richard Lynch! It would be really cool if the scanner guys can use their thoughts to painfully change themselves into other human shapes and even make other guys' heads to expand eight times twice as bigger and wider. They ought to make over millions of new weird Scanners movies, and do hundreds of more and bigger special make-up bladder effects. That would be really awesome. I really love all the terrifying head expansion air-bladders special effects on these scanners films!!! And I really want other new guys to make many, many more new 'Scanner Cop' movie sequels. Like I said before, They should make about a million more new 'Scanners' movies and a million more new 'Scanner Cop' movies, and should use a thousand more and bigger air-bladders special makeup effects.